Disciples of Christ blogger Dennis Sanders is an openly gay pastor with Asperger’s syndrome. He writes an interesting blog that has lots of good stuff on it. Which is why I think Progressive Christianity can be at times the worst of both worlds for mainline denominations. It drives away those who might want a deeper spiritual life as well as those who have differing opinions on politics, and it tells those outside the church that it really doesn’t matter if you are Christian as long as you vote for the Democrats. I’m not advocating that churches become conservative or that only good Republicans can be Christians. I am saying that Progressive Christianity really wants to be taken seriously, it will have to be more self-aware of how faith and politics can mix in not so good ways and it will have to offer a more robust faith and theological view than what it does now. Just yesterday, my wife and I had a conversation that wound up the same place as Sanders’ post. My wife is a proud “Jesus is a liberal” Christian. But she too often finds herself having to defend having a robust Christianity in her church or having Christ at the center of her social justice passions. She laments the fact that having “too much Jesus” at church is a complaint that gets made by people. I suspect advocates of progressive Christianity would point to the writings and talks by the luminaries of the movement that are robust in their Christology and orthodox in their theology. But Sanders’ observations ring true to the way on-the-ground and in-the-pew progressive Christianity often looks in many mainline churches. My experience of blogging is that large numbers of politically liberal Christians on the Internet are refugees from aggressive forms of fundamentalism or conservative evangelical Christianity. In at least some wings of the mainline, however, the issues raised by Dennis Sanders are much more pressing and much more troubling to people who want to proclaim the name of Jesus as Lord and Savior and also vote for Barack Obama. I spent a bit of time this morning trying to get a handle on progressive Christianity. I realize one flaw at the beginning is my hope to understand it as a unified thing. 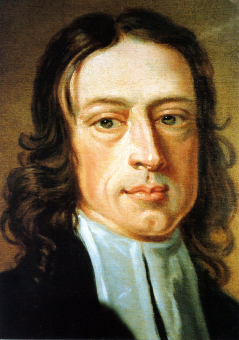 One of the main thrusts of progressive Christianity is its fierce pluralism. But I was able to find a couple sources that claim to speak for the major issues or beliefs in the school. 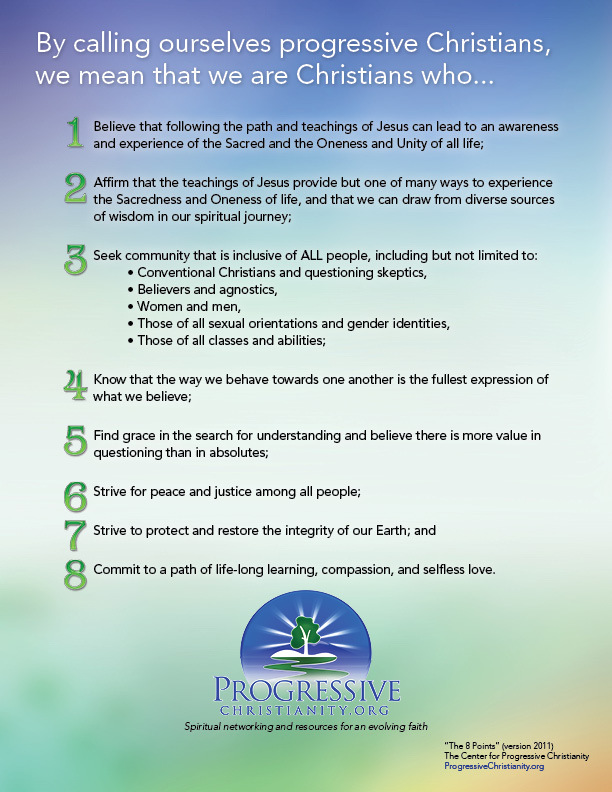 The Phoenix Affirmations set an outline of the faith for at least one group within the progressive Christian movement. I read these, and I am taken back to my days of reading Joseph Campbell‘s books on mythology and religion. I read these 8 points, and I wonder why — if I affirmed these points — I would bother to be a Christian at all. Is Christianity really about nothing more, in the end, that developing an awareness of “the Sacred” and the “Oneness and Unity of all life”? Can’t I do that with peyote and leave Christ aside? Progressive Christianity strikes me as on its most robust footing when it is critiquing traditional, orthodox Christianity. That is when its statements and claims seem the most solid. Anything in the Bible that looks miraculous or contrary to the normal functions of the natural world is not factual, but rather is mythological. The Bible is best understood and appreciated from the perspective of religious pluralism – the idea that other religions can be as good for others as mine is for me. In this context, the Bible can be seen as a vital part of the great global conversation throughout history about the relationship of human beings to ultimate reality. Similarly, when progressive Christianity tries to make affirmations like the ones in these 8 points, it reduces quickly to a rather shallow soup of contemporary values. The Boy Scout oath has more risk and edge to it. I cannot imagine Pontius Pilate wanting to waste the nails it would take crucify someone over this. I cannot image the villagers taking up stones to throw at Jesus for preaching this. I cannot imagine Peter being able to debunk the “they are all drunk” thesis if he had declared these as his 8-Point Pentecost sermon. None of this is persuasive to progressive Christians, of course, because pluralism and being non-dogmatic are the sacred center of the faith. Faulting it for being a muddle of mush is probably a badge of honor for the authors of the 8 points. Indeed, I can be a progressive Christian (as far as I can see) by being a politically progressive member of a Western nation. As a person who voted for Barack Obama and watches the Daily Show, I feel as if I have all the equipment that is required of me to be a progressive Christian. My experience of progressive Christianity is that the first word is the most important one. Progressive Christianity asks me to be progressive first and Christian only to the extent that does not step on my prior commitment to being progressive. In that way, it is a bit like being a German Christian.